Heba, an Arab woman who lives in Sweden, has been in Iran recently to get a nose job. She made the trip alongside her mother, who came with her to take care of her daughter after her surgery. Heba has just paid the last visit to her doctor to get the nose splint removed and get it taped before flying back to her country. The young woman had been in search of a good doctor for her nose surgery for almost a year before hitting the road to Iran. After having done a lot of research on many rhinoplasty surgeons in Europe and Asia, Heba finally found the Iranian doctors the best choice for her ideal nose job. 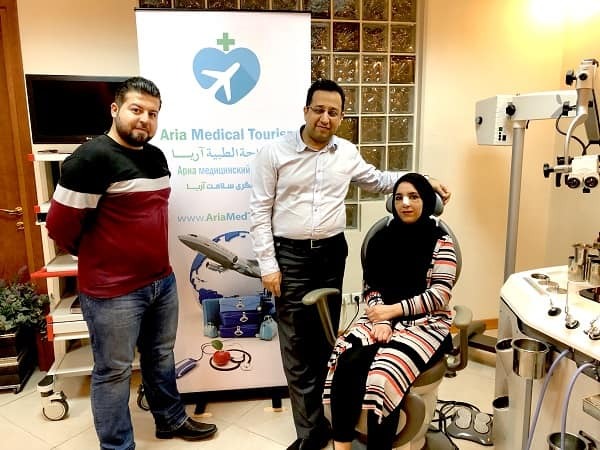 While searching the internet to find a good Iranian doctor as well as the way she could make the arrangements to head to Iran and receive the treatment, Heba came across AriaMedTour website. She browsed a few pages including pages about rhinoplasty services in Iran, their advantages, and the services AriaMedTour offers to international patients, all of which Heba found very attractive and advantageous. She also watched patients’ video testimonials in which people talked about their experiences of having a plastic surgery, especially a nose surgery, in Iran, which made her more willing to have her nose job, too, in this country. She did not hesitate to fill out the inquiry form on the website for a free quote and consultation, in which she asked her questions about a rhinoplasty in Iran. After our coordinators received her inquiry, they got back to her immediately to provide her a free consultation and information regarding her treatment. She sent a few photos of her nose as a preliminary step in our consultation process. Then she was shown some ‘before and after’ photos of previous rhinoplasty works by some of our surgeons, among whom she chose Dr Boromand, a very talented and experienced rhinoplasty surgeon based in Tehran. Soon after, Heba made up her mind to head to Iran and go under the skillful knife of one of the best nose surgeons in the world. She was a little bit worried about the travel at first. Bothered by the thought of the inconvenience and hassles of a foreign trip for a surgery, Heba needed some assurances to make sure that her medical trip will be safe and trouble-free. Therefore, she kept her contact with AriaMedTour for a couple of weeks, during which she asked more detailed questions about how her travel and stay in Iran will be arranged and how she would receive services before and after her possible surgery. She was given detailed information by AriaMedTour team with regards to services the company will provide her, including arrangement and booking of doctor, clinic and hospital, hotel, transportation, interpreting service and follow-up. After resting assured that the travel will go well and there will be nothing to worry about during her medical tour, Heba decided to bring her mother with her as well to make her experience as lovely as possible. Next, she let the AriaMedTour know about her suitable date for the surgery and they agree that everything be organized by the company. 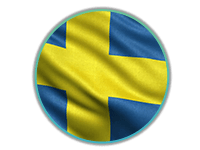 After visas were issued for them with the assistance of AriaMedTour, they booked their flights. The doctor visit and surgery appointment were also fixed by AriaMedTour. As soon as Heba and her mother arrived at Tehran’s international airport, they were received by AriaMedTour interpreter and guide there. The interpreter welcomed them with flower and took a modern private cab to take them to their hotel, which was already booked by the company. They stayed the night at the hotel to get a rest and get prepared to visit the doctor the next day. The next day, the guests were taken to the doctor’s private clinic by AriaMedTour interpreter. The doctor visited the patient (Heba) and they talked for half an hour discussing a number of issues, including the procedure, the pre-operative instructions, the results and so on. The patient let the doctor know about her expectations by showing him some model pictures she wanted her nose to look like after the surgery. She wanted to have her dorsal hump removed and have the slightly drooping tip lifted. She also had a slight deviation which he wanted to be corrected. 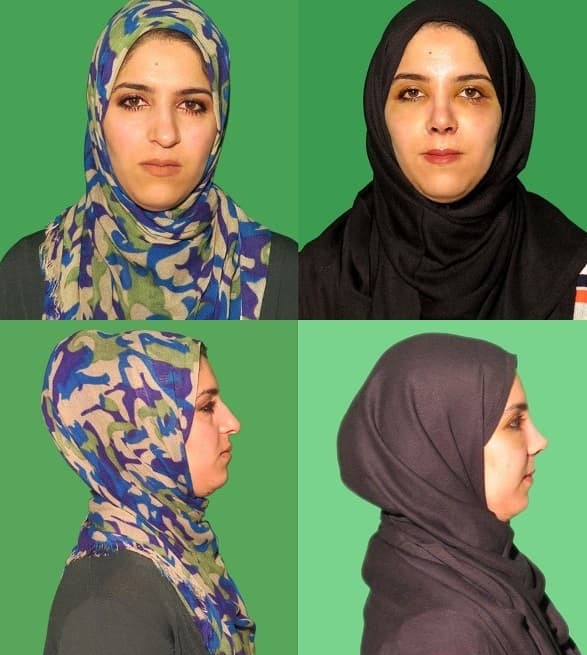 Having carefully listened to her demands and expectations, the doctor then took Heba to a special room for photography—which were used for analysis as well as making a comparison (before and after photos). He also gave orders for some pre-op tests, the results of which he also analyzed the same day. After the first visit with the doctor, Heba and his mother were taken to their hotel again by AriaMedTour interpreter. As the next day the patient would be undergoing her rhinoplasty, she had to follow some pre-op instructions. All these instructions and advice were conveyed to them through AriaMedTour interpreter the night before the surgery appointment and she completely prepared herself for the operation. The next day, they went to the hospital in which the surgery was going to be performed—a modern hospital in central Tehran. They visited the doctor once again to review the matters. The doctor once again listened to her expectations and gave some words to make her psychologically prepared for the surgery. After the surgery was completed, Heba was taken to a special room for the post-op recovery under the supervision of the hospital’s caring nurses. She was taken care of for a couple of hours until she was well enough to go home. The surgical team examined her again and gave some instructions for her recovery period. The doctor instructed that she eat soft food for a few days, not sleep on her stomach, and use cold compress, all conveyed to her through the AriaMedTour interpreter. Then she was discharged from the hospital and together with her mother went back to their hotel. As a rhinoplasty requires the patient to visit the doctor six to seven days after surgery, they stayed in Iran for another six days. During this period, the patient was being constantly supported by AriaMedTour by being provided with the doctor’s follow-up instructions through the interpreter. One special option of AriaMedTour hotels is that they offer patients special services for their convenience. For instance, they do the shopping for them, bring them their meals at the room and so on. During the days Heba and her mother were staying in Tehran, they visited some places in the city with AriaMedTour interpreter. They went out to cafes and restaurants and had traditional Iranian food. They also went shopping at the Grand Bazaar of Tehran and other bazaars to buy some clothes and gifts for Heba’s little children who were waiting for their mom’s and granny’s return from Iran. On the sixth day, Heba went to the doctor’s office again to remove the splint of her nose and have it taped and be instructed how to do it at home by herself. On the removal of the splint and bandage, Heba was thrilled to see her new nose—her dream nose indeed—and that her dream had come true. The mother was also very pleased with the result of her daughter’s surgery. They thanked the doctor for his excellent job and expressed their willingness to suggest a younger sister to also come here to have a nose surgery with the same doctor. Beside the perfect shape, there were little bruising and swelling on Heba’s nose. 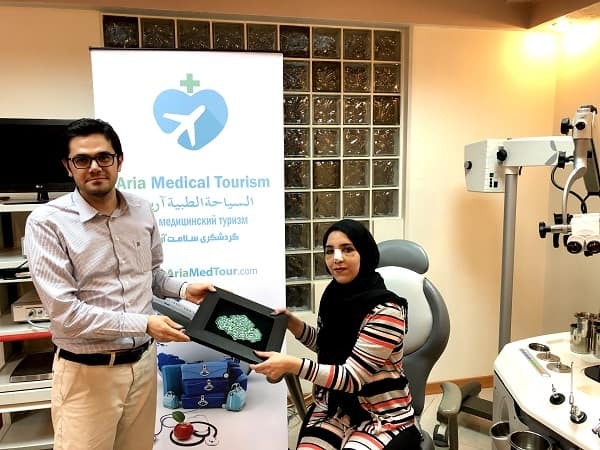 As the last stage of the process of a medical tour organized by AriaMedTour, the guests were presented with a piece of Iranian handicraft as a souvenir. Asked if she was willing to talk about her experience of traveling to Iran and getting a rhinoplasty, Heba expressed her willingness and had a brief bilingual interview (in Arabic and Swedish). She voiced her immense satisfaction with both medical and tourism services they received from AriaMedTour and the medical team. During the week-long stay in Tehran, our staff at AriaMedTour were available to assist Heba and her mother wherever they needed something or wanted to go somewhere. Finally, the AriaMedTour interpreter took them to the airport and saw them off. As the long-term follow-up options during the recovery period are available for patients who come to Iran for treatment through AriaMedTour, Heba is going to keep in touch with us to ask questions and get answers with regards to her recovery.